Live analysis: Caruana – Carlsen game 1 with Lc0 and SF lines here! Hello everyone and welcome to the live coverage of the 2018 World Chess Championship match between the reigning champion Magnus Carlsen (Norway) and the challenger Fabiano Caruana (USA). In this live blog from WCC 2018 we will be covering the event Carlsen – Caruana with the latest news, developments, interviews, and in-game details. All the recent success and steady career growth of Fabiano Caruana led to one major question. Has America found its new Bobby Fischer? US media jumped on the topic right away. The NY Times published an article by Pia Peterson “Searching for the Next Bobby Fischer, the U.S. Finds Fabi”, followed by Sean Gregory’s article in Time, “This Kid From Brooklyn Could Return America to Chess Dominance for the First Time Since Bobby Fischer”. Exactly the small length of the match is Carlsen’s biggest concern at the moment. He repeatedly admitted that he is not in his best form and that a wrong step could throw the match in any direction. 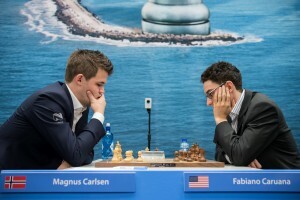 At the same time Fabiano Caruana is at his best ever – with 2832 ELO he is just 3 points behind Carlsen, while this year’s chess performance of the US player, excluding his first tournament of the year, is only eclipsed by Ding Liren’s amazing record run. In January, Caruana finished 11th with a score of 5/13 at the Tata Steel Masters tournament, which was a disaster by any standard for a player of his rank. But already in March he won the Candidates Tournament 2018 with a score of 9/14, thus winning the right to challenge Magnus Carlsen in the World Chess Championship 2018 in London in November 2018. From 31 March to 9 April, Caruana competed in the Grenke Chess Classic 2018 where he won the event with a score of 6½/9, a point ahead of runner-up and future WCC oponent Carlsen. With this result he moved to No. 2 in the live world rankings, a position that he defended and solidified in future events even getting a chance for a shot at the first place before the match. From 17 to 30 April, he competed in 2018 U.S. Chess Championship, placing second with 8/11. In June, he won the sixth edition of Norway Chess 2018, finishing clear first with a score of 5/8 (+3–1=4), despite having lost to Carlsen in the first round. In August, he jointly won the Sinquefield Cup 2018 with Carlsen and Aronian. Today was the official drawing of lots for the match. Carlsen drew the black pieces at the opening ceremony and Fabiano Caruana will start with the white pieces in game 1. The draw rate in head to head games where Caruana is white vs Carlsen is relatively low, only 50%. From the 16 official classical games they played 8 finished in a draw, with 5 wins for Carlsen and 3 wins for Caruana.